I said Hogchula not hog spider mix. Although that is the intention of the cross breed, I actually had something else in mind when thinking of "Hogchula". Not simply a something that resembles a pig/hog/boar in nature. No that is not what I had in mind. What I had in mind when thinking of that name, was a Tarantula like spider that was a bit more beefy. Bigger body structure with the legs having a more larger shoulder connection that goes smaller as each goes down to their feet/hands. (tips of their legs that would make the end) At least that is what the general breed would be. Having a bit of strength in appearance and also having the delecate ends to string them a web of their own; that would be strong enough to hold them... Plus if the intention of spiders anyway are to be farmed for rope, why not. Well was the general idea behind the name. hog not necessarily meaning what it sounds like, as it could be a veracious eater, hence the hog title. Being territorial by nature unless trained/tamed to produce for the underworld. Kind of like a squid that feeds continuously throughout its' life getting bigger with each bite. Mainly just thought the name sounded good. 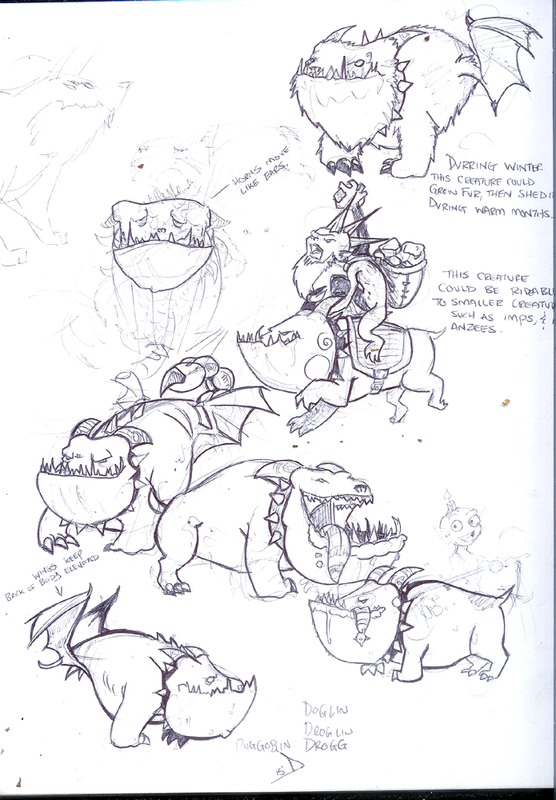 So, this is the creature I was thinking, right from the sketchbook, warts and all. I rather like the design with them having bat wings doe hind legs as it looks good and I don't think I've ever seen it anywhere before, but.. could be tricky to animate. So, there's a few different versions in here, but all with the same sort of spirit. Not really so much a conniving sort, just sort of a stupid, monstrous bulldog demon goblin thing. Become partial to calling it a 'Pug-Goblin', but Drogg works too. If a sort of tamer mechanic was implemented, I'd imagine this would be one of the lowest tier beasts. One of the first ones you mange to conquer and tame. But, then again, he sort of looks like he belongs to the gobo-daemon crowd already. So, I dunno. Oh, but I want to bring up another point.. Wouldn't the Impanzee make a nice beast tamer unit? I rather like the little long armed bastards, but they don't really have much a role in the game right now. I think making him a rock chucking distance attack creature with the ability to tame beasts would rather solidify his place in our dungeons. And in our blackened hearts..
Oh, and just to reenforce my though on Impanzees being a distance attack class, check the rock quiver. Oh, and I didn't mean to blow off what you said, Tamorr. I get it now, hog as in hoggish. Is alright, I understood where you were coming from. what I imaged of drogg wasn't bulldog frame, but more of a wolfish like look. Like the drawings, way better than I would been able to do at the moment. Haven't practiced in years... Anyway either way that might work as well. especially if it was more hairy like the top right one you drew. That fits quite well. Unsure what to make of the wings... Definitely different. Reason I was saying more wolfish is the hound sense of having a longer snout. At least in the face. Not sure what that would look like attached with a bulldog mass, but would look different. Most dogs & canine cousins seem to have varying sense of smell depending on the breed, and what I had in mind of the drogg was having a very keep sense of smell; hence the snout I mentioned. usually the long snout ones in canine family seem to have the best sense of smell due to the passage of the nasal. All seem to have this passage, but not all are defined enough to pick up like a blood hound. furrball in a sense most of the time but bulky build like what you drew. Definitely some excellent ideas there that have been posted. Yeah, I dunno, I hit upon this and it sort of felt right. Not 100%, mind you.. styles a little off. Eyes are to beady, for one. It's close to, but not quite on the money for Dwelver's style of 'off cute' that it has going on. As for it not be a wolf, well, you might be right on the nose thing. But, I don't think that's a big deal. That's like one of those things that only a hand few of people know about in terms of the whole. So, yes, dogs with long noses have the best smell. But a short nosed dog creature isn't going to be automatically viewed by most as having a weak sense of smell. It's like Salamanders in DK2. Salamanders aren't reptiles. They are amphibians, like frogs. But in the game they are refereed to as reptiles. Now, I grew up around a small reptile farm. So I know that salamanders aren't reptiles.. But most people don't. Now, if there was a real worry for giving an automatic impression that the drogg has a masturful sense of smell. A demonic bloodhound would be a good way to go about it, simply because that bred of dog is infamous enough for people to know without even being told that it has a great sense of smell. However, the bulldog has an automatic impression of being a guard dog, and brutish in nature. So, these unconscious concepts are just as good for the unit were toying around with here. But that could be a generational conception since a lot of these ideas, I think, might have been implanted by old Looney tunes. Hm, I have a more wolfish concept too, somewhere. I might dig that up and throw that up here as well. Oh, anybody have any thoughts on the impanzee filling the role of beast tamer? Anyway I actually can see the impanzees being the tamer sort, as it would make sense being wild themselves. yeah it wasn't really to show a keen sense of smell, it was more to give a altered appearance to the drogg beyond a recognizable breed. The only thing for certain would be it would more likely look like it belongs to the canine family. Reason for the mix, and match. And I understand what you mean, as those are the type of cartoons I kind of miss seeing in today's society. Regardless yes more like a guard dog, but with distinct features that set it apart from just being a bulldog. Which is what I was getting at. Mainly. And you are right about that, not many would know. Salamanders... Yeah nature is something I know more of than the average person. >< At least of the people I have met... Lots of backpacking in my kid/youth/adulthood... Glad my parents took me on those. Always fascinated by nature.